Glaston Compressor Services is proud to be able to provide an air compressor hire service. We have a number of air compressors for hire in the UK and also offer air compressor hire and leasing packages for customers who require a temporary air compressor system. Glaston offers a total solution to our customers through design, installation, maintenance and project management. We have experience servicing a range of industries, including the manufacturing, packaging and food processing industries. We recognise that each of our clients has individual requirements and pride ourselves in our ability to be able to tailor our services to the specific needs of our clients, finding out if air compressor hire would be the best fitting solution for their business. Our team of trained air compressor engineers have the knowledge and expertise to provide a comprehensive and flexible range of services. Our bespoke air compressor rental and leasing packages are tailor-made to suit your company’s needs and budget. Glaston will identify energy saving opportunities to ensure that we can guarantee outstanding performance, whilst maintaining cost-efficiency. In addition to our air compressor rental packages, we also have a wide range of used air compressors that are available for resale. 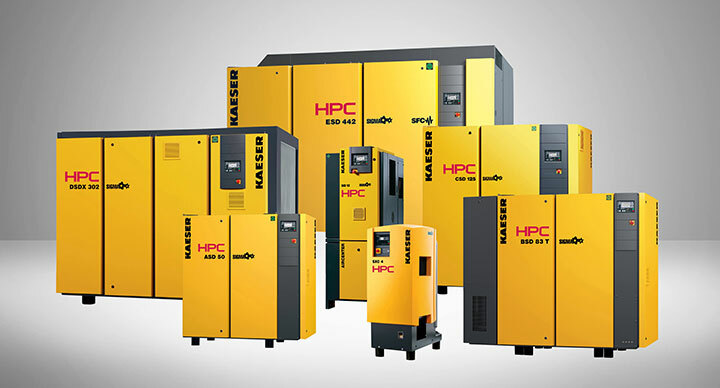 Glaston is an authorised UK distributor of HPC KAESER Compressors. If you need to rent air compressor products, and require any more information about our air compressor hire and leasing packages or our air compressor maintenance services, please do not hesitate to contact us. Let our experts assess if air compressor hire is the right solution for your business. If you’d like to speak to a professional about air compressor hire, contact Glaston today. You can also speak to us about our other products and services, including nitrogen generators and vacuum pumps.